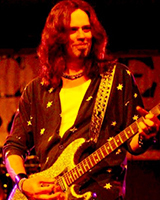 As a seasoned veteran guitarist, Scotty London has displayed unique versatility by writing, recording, and performing with a wide variety of very popular top-notch Bay Area original artists. From the power pop of Cement Trampoline, to the heavy hard rock of Lizzard Kings, to the country/southern rock of P.T. and the Deadman Band…Scotty has the experience and skills to teach in many styles at any skill level. He is currently a member of the newly re-formed incarnation of legendary Bay Area band Earth Quake. Scotty has been a full-time guitar/bass instructor for over 15 years, and has a long list of satisfied happy clients.